June 18, 2011 was my birthday and I awoke at 5:30 to small pains in my lower back. I wondered if this was the day for Emmalin to finally come and meet her family. Within 30 minutes, I knew the answer to that question. I knew that it was time to head to the hospital. I called Chad and family to deliver the news. We are going to have a baby today…what a glorious 40th birthday present. Emmalin decided it was time to come into the world. Unfortunately, we were still at home. After a quick 911 call and an exciting ambulance ride to the hospital, Emmalin did hold on long enough to get me to the birthing room and get her dad on Skype. As soon as she knew that we were all present and paying attention, she decided to join us. When I saw our beautiful daughter for the first time I knew she was unique. Caught up in the overwhelming experience, I enjoyed the miracle of birth. Emmalin had all of her fingers and toes and looked so very healthy…that is all that mattered. She had hair (not something we were used to seeing on our babies), and her eyes had a beautiful almond shape to them. When the doctor placed our daughter on me, I felt her warm skin. I knew that we were okay, and the hard part was over. Now it was time to celebrate her life. Later that night, I was informed that Emmalin was having a little trouble with her oxygen levels. The doctors decided to take her to NICU to watch her closer. “No worries,” I was told. Knowing that God had our little angel in his hands, I did just that…did not worry. Later that night while visiting Emmalin in NICU, I was told that she appeared to have Down Syndrome. 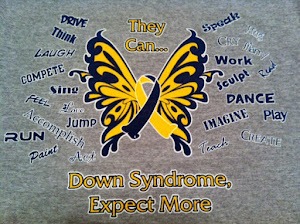 Down Syndrome, you must be mistaken, I thought. She looks perfectly healthy. How can this be? Are you sure? Am I really hearing this? What will we do? This is not the story that we have written, this is not the picture that we painted, this is not our plan. Are we strong enough, smart enough, patient enough for this? Also, not in our plan was the heart defect that commonly accompanies Down Syndrome. The remaining nights, we sat in NICU together waiting for Chad to return home and hold us both. That would make things better. That is the only thing that could take our pain away. I would hold Emmalin every chance, sing to her and feel the tears roll down my cheek only to fall onto her tiny body. I begged God to take all of this away from her. Only He could fix her. Only He could heal her. When Chad finally arrived home and was given his new daughter’s diagnosis, he held her and me just as I expected he would. Finding faith and acceptance much faster than I did, he would help us through and keep us standing in the middle of these struggles. The next few nights consisted of trying to become a family and looking for answers to all of our questions. Why us? Why now? What did we do wrong? As the days passed and after hours of holding our daughter, we began to heal. God did not answer our questions of “Why?”, He simply said “Trust Me” and THAT we had to do. It was our ONLY option. We will continue to heal, and Emmalin will get stronger every day. We are on a new journey now. This journey will involve new books, new vocabulary and some new methods of parenting. We will learn new coping skills, new growth, new challenges and new love. Some days we will fail, but we will wake up the next day with a brave heart to try again. We will only be successful with the support of those around us. Those who will help guide us down this new path: doctors, teachers, grandparents, other parents, organizations, God and Emmalin herself. We know that opportunities for children and adults with Down Syndrome have improved, and we thank God every day that Emmalin was born in the USA. When you’re going to have a baby, it’s like planning a fabulous vacation trip -to Italy. You buy a bunch of guide books and make your wonderful plans. The Coliseum. The Michelangelo David. The gondolas in Venice. You may learn some handy phrases in Italian. It’s all very exciting. But there’s been a change in the flight plan. They’ve landed in Holland and there you must stay. The important thing is they haven’t taken you to a horrible, disgusting, filthy place, full of pestilence, famine and disease. It’s just a different place. But… if you spend your life mourning the fact that you didn’t get to Italy, you may never be free to enjoy the very special, the very lovely things …about Holland. Chad and I quickly realized that Italy was not the place for us this time. We have seen Italy together and will gladly experience Holland as a family. But please know that we can still go to Italy. ANYTHING is possible. Down Syndrome is Emmalin’s diagnosis, but we will not allow it to be her disability. We, as a family, will strive to make her reach every dream she desires and will always encourage her to dream big. She can accomplish all things through God. God has been preparing us for her for many years. He has been building our strength, knowledge, faith and marriage only to prepare us for the birth of her. He gave us signs along the way. We just did not have our eyes open to know what God was preparing us for. Now knowing His plan, we pray that God will give us the bravery and strength that we will need to face each day. Emmalin Kate Ambeau made an exciting entry into our world on a day that I grew one year older. Little did I know that in less than 4 hours from the first contraction how much I would grow. ..not in years, but in faith. Thank you God for blessing us with this little girl. She has been a journey to meet and will be a journey to raise. Thank you, God, for giving us such a rarity in this angel on Earth.